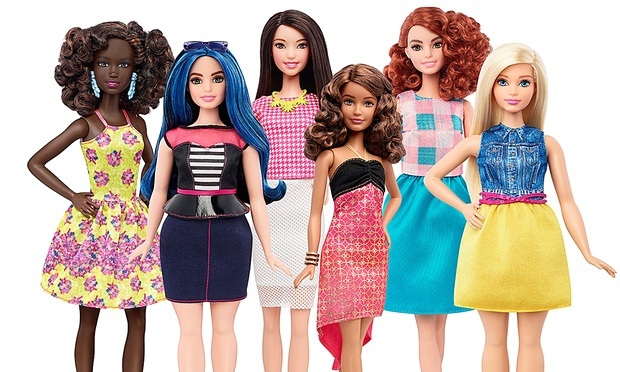 JUST one month into 2016 and we’ve already won the war against sexism and body oppression, thanks to toymaker Mattel releasing a new range of “evolved” Barbie dolls. Everyone give yourselves a pat on the back. I never had a Barbie as a child. I had a Michael Jackson doll (sadly dumped at a charity sale decades ago and now probably worth more than my house) and a talking Mr T figurine that said things such as “I PITY THE FOOL” and “I LOVE IT WHEN A PLAN COMES TOGETHER”. My mother denies ever buying me this, but sorry mum, you just can’t make up memories like that. Maybe if Barbie had “evolved” sooner I might have been interested in her, although probably only if she’d evolved in a Darwinistic way and developed opposable thumbs and knees that could actually bend. Because that was always the problem with Barbie: she didn’t do anything. She just looked pretty and had nice hair and stood very still. Actually, she didn’t even stand — with those stupid pointed feet of hers she always had to lean awkwardly on things. Which brings us to the new “evolved” Barbie. The 2016 “Fashionistas” line features three new body types — “tall”, “petite” and “curvy” — as well as some new skin and hair colours. Now Barbie isn’t just a thin blonde who can’t stand up on her own, but a short blonde with big hips and olive skin who can’t stand up on her own. And for some reason everyone has been applauding this as some sort of win for feminists. “We have to let girls know it doesn’t matter what shape you come in, that everything is possible,” beams one Mattel staffer in the commercial. Everything except bending your knees and standing up without assistance, obviously. While it’s all very nice that little girls can finally own a Barbie that looks slightly more like their mum than the original one did (although whether this was ever supposed to be the point is debatable), let’s not pretend this is some breakthrough moment for feminism. Let’s call it for what it is: marketing. People just aren’t buying Barbie anymore. Just this week a Fortune magazine report showed that sales of the doll slumped 16 per cent in 2014, their third consecutive year on the slide. So now instead of trying to sell millions of identical blonde dolls, Mattel will sell many more millions of brunette dolls, and black dolls, and tall dolls, and dolls with prominent hips, to misguided mums and dads who think this sort of thing is actually important. And it’s really not important. Because while it’s nice to think the diversity of the range has expanded (along with Barbie’s waistline), the end result is still more of the same Barbie bulldust. We’ve all been hoodwinked. The new Barbies might be taller than the original, or shorter, or more Kardashian-like in the rear, but they all still have beautiful, long, glossy hair. They still have doe eyes with giant lashes, and impossibly pink lips. They all have a thigh gap — yes, even the “curvy” one (a real feat of nature, that). They still wear very feminine clothes and high heels and carry handbags. They still don’t actually DO anything. The new range of Barbies is about as diverse as this year’s crop of Oscar nominees. “This is what our future looks like, because this is what the world looks like,” another Mattel staffer says as the video shows a line-up of shiny Barbies in designer outfits, standing in front of a hot pink toy sports car. As my favourite childhood doll would probably say: “I PITY THE FOOL”.